Credit Report The single most important document for protection against identity theft. Download "Credit Report The single most important document for protection against identity theft." 1 Understanding your Credit Report The single most important document for protection against identity theft. 2 What to do if you spot errors A recent study shows that 79 percent of credit reports contained mistakes of some kind. Creditors report billions of pieces of information to credit bureaus each year. It s not unusual to find your name is misspelled; but there is cause for alarm if you discover an entirely different name, address or driver s license number on your report. Under the Fair Credit Reporting Act, credit bureaus and any business that supplies them with data must investigate consumer disputes at no charge, generally within 30 days. Within five business days of completing its investigation, the bureau must send you the results, a revised copy of the credit report and information about your rights. Corrections must be sent to all major credit bureaus, so you don t have to contact them yourself. 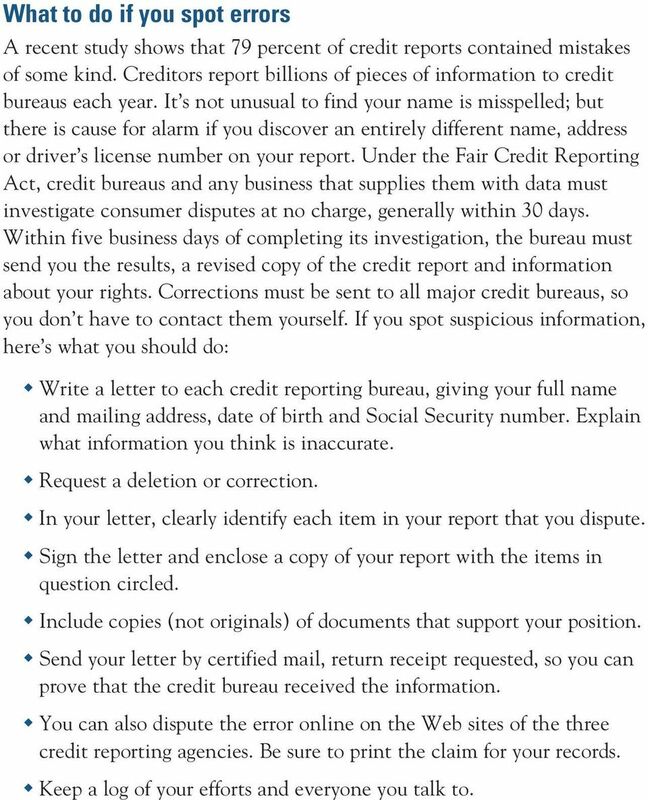 If you spot suspicious information, here s what you should do: Write a letter to each credit reporting bureau, giving your full name and mailing address, date of birth and Social Security number. Explain what information you think is inaccurate. Request a deletion or correction. In your letter, clearly identify each item in your report that you dispute. Sign the letter and enclose a copy of your report with the items in question circled. Include copies (not originals) of documents that support your position. Send your letter by certified mail, return receipt requested, so you can prove that the credit bureau received the information. You can also dispute the error online on the Web sites of the three credit reporting agencies. Be sure to print the claim for your records. Keep a log of your efforts and everyone you talk to. 3 When was the last time you checked your credit report for accuracy? How do you obtain your credit score? What does your credit report mean to those who lend you money and credit? Not only does your credit report affect your financial life, it can also affect your career, education and the interest rates that lenders offer you. Your credit report should make you look as financially attractive as possible. 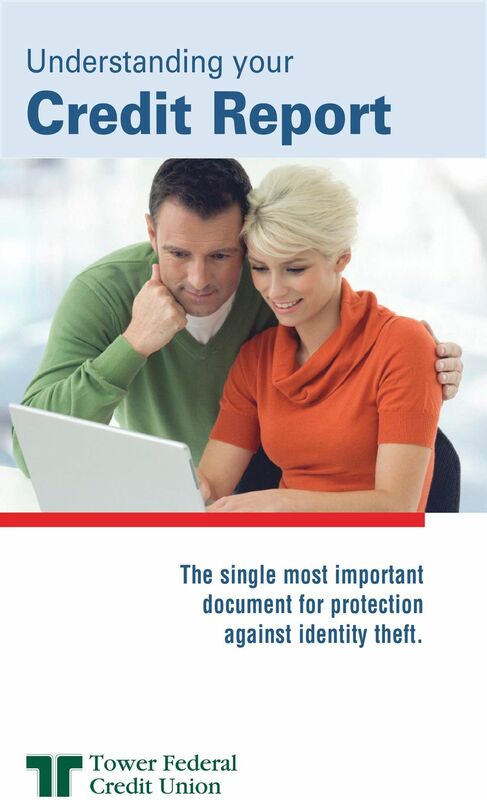 Your credit report is the single most important document for protecting yourself from identity theft. By periodically reviewing your credit report, you can see your payment history, understand how your credit is rated, and prevent errors from going undetected. Credit reports from the major reporting agencies Your credit report also referred to as a credit file, credit history or credit rating is a compilation of your payment history on all credit accounts to judge your credit worthiness. The three major credit reporting agencies are Equifax, Experian and TransUnion. They don t share information, so one report may not be identical to another. Information about your existing and past credit accounts mortgages, credit cards, student loans is reported to the bureaus, while judgments, liens and bankruptcies are found by the bureaus from public records. Credit bureau affiliates Besides the three major reporting agencies, there are hundreds of credit bureaus called affiliates that collect financial information for their customers. 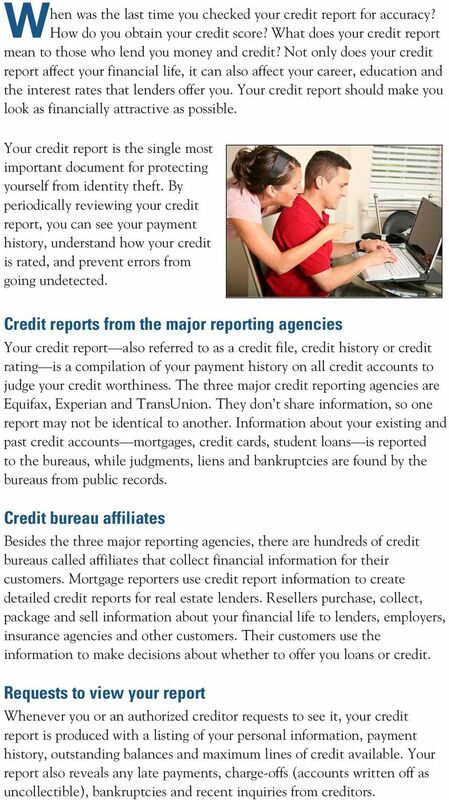 Mortgage reporters use credit report information to create detailed credit reports for real estate lenders. Resellers purchase, collect, package and sell information about your financial life to lenders, employers, insurance agencies and other customers. Their customers use the information to make decisions about whether to offer you loans or credit. Requests to view your report Whenever you or an authorized creditor requests to see it, your credit report is produced with a listing of your personal information, payment history, outstanding balances and maximum lines of credit available. Your report also reveals any late payments, charge-offs (accounts written off as uncollectible), bankruptcies and recent inquiries from creditors. 5 Your credit score Your credit score, also known as your FICO (Fair, Isaac & Co.) score, helps a lender gauge the likelihood of a loan being repaid. Your FICO score is available for a small fee from any of the three credit reporting agencies or annualcreditreport.com. While your credit report is a reflection of your financial activities, your credit score is an analysis of your credit worthiness based on your credit history and current credit accounts. 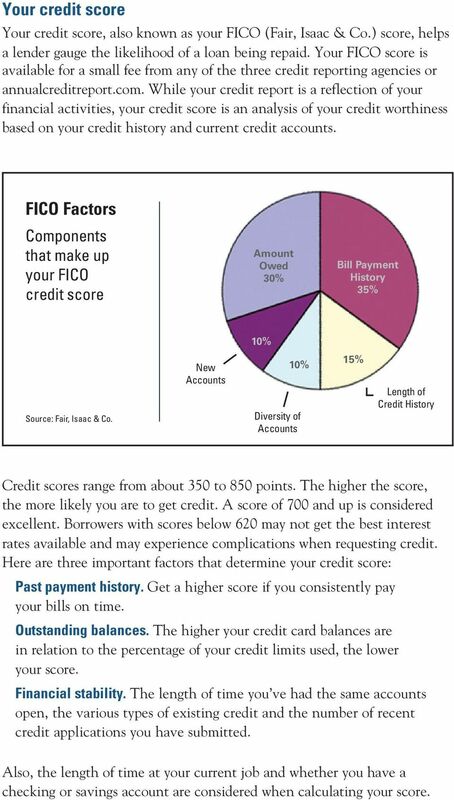 FICO Factors Components that make up your FICO credit score Amount Owed 30% Bill Payment History 35% 10% Source: Fair, Isaac & Co. New Accounts 10% Diversity of Accounts 15% Length of Credit History Credit scores range from about 350 to 850 points. The higher the score, the more likely you are to get credit. A score of 700 and up is considered excellent. Borrowers with scores below 620 may not get the best interest rates available and may experience complications when requesting credit. Here are three important factors that determine your credit score: Past payment history. Get a higher score if you consistently pay your bills on time. Outstanding balances. The higher your credit card balances are in relation to the percentage of your credit limits used, the lower your score. Financial stability. The length of time you ve had the same accounts open, the various types of existing credit and the number of recent credit applications you have submitted. Also, the length of time at your current job and whether you have a checking or savings account are considered when calculating your score. September 2008 How to Dispute Credit Report Errors Y our credit report contains information about where you live, how you pay your bills, and whether you ve been sued or arrested, or have filed for bankruptcy. 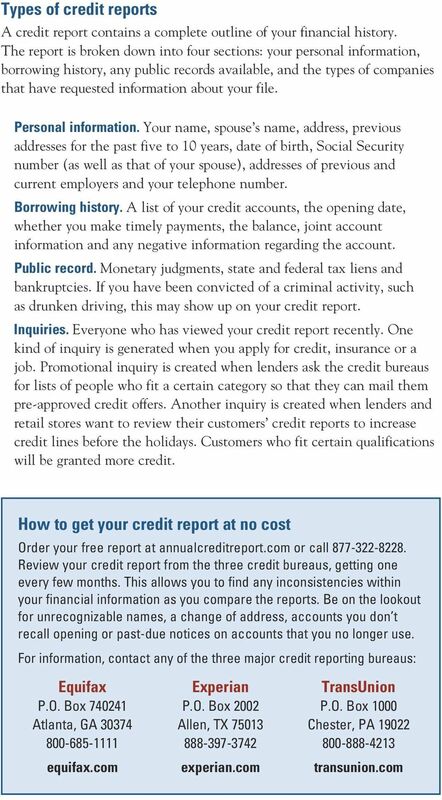 CREDIT REPORT: Adapted from the National Consumer Law Center Inc s. brochure entitled, The Truth About Credit Reports and Credit Repair Companies. Understanding a Credit Report! April 21, 2011. New York City Department of Consumer Affairs. All rights reserved. TABLE OF CONTENTS. CHAPTER 1: Credit Report.. Page 1. 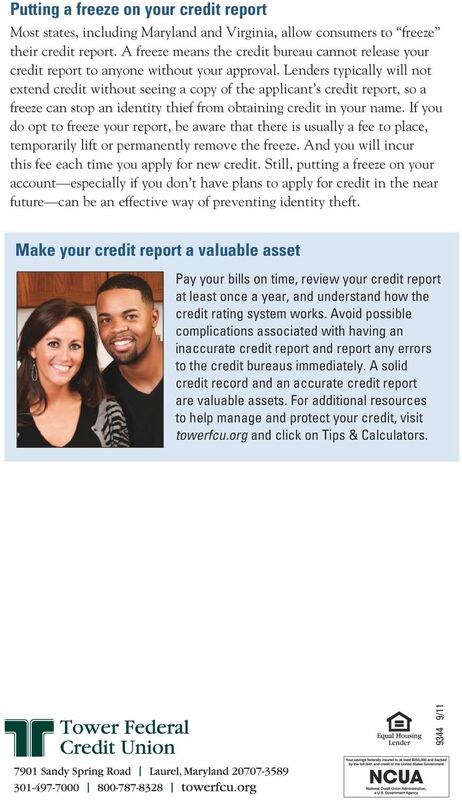 CHAPTER 2: Credit Score...Page 3. CHAPTER 3: Credit Reporting Agencies. Credit Scores. www.howtogainwealth.com. Copyright 2009 How to Gain Wealth. All rights reserved. W I S C O N S I N Office of Privacy Protection Safeguarding Information for Your Future Credit report security freeze Wisconsin consumers have the right to place a security freeze on their credit reports. Your Credit Report The three major credit bureaus in the United States are Experian, TransUnion, and Equifax. These companies acquire data from banks, credit unions, mortgage lenders, and retail establishments. Main Idea Your personal credit history and credit score determine whether or not you qualify for loans and the interest rate on those loans. Fixing Your Credit Someday (maybe even today) you will want a car. Like almost everyone else, you will need a loan to pay for it, and you will need insurance to protect the car in case of an accident. SECURITY FREEZE INFORMATION Any consumer in New York may place a security freeze on his or her credit report by requesting one in writing by certified mail or overnight mail to the consumer reporting agencies. Your credit score. What it is. What it means. What will a new creditor who requests my file see if it is frozen? A creditor will see a message or a code indicating the file is frozen. SECURITY FREEZE INFORMATION An identity theft victim in Mississippi may place a security freeze on his or her credit report by requesting one in writing by certified mail to the consumer reporting agency.